There has been lots of talk lately about the paper mill in Brainerd and about the Brainerd Local. There used to be another interesting industry there – the BN’s Brainerd Tie Plant. To move raw ties into and out of the treating ovens, they used the fireless 0-4-0 seen below. The BN owned and ran the tie plant, so in my book that means that they owned the locomotive and hence, BN steam! The tie plant office was a wonderful wooden/steel underframe open platform observation-parlor car. It was remarkably intact, including brake rigging and buffers/diaphragms, but on a foundation and without trucks. The seats had all been stripped out, but the drawing room was still there, though again without seats, and in the main body the wonderful brass individual luggage racks were still over where each parlor seat had been. 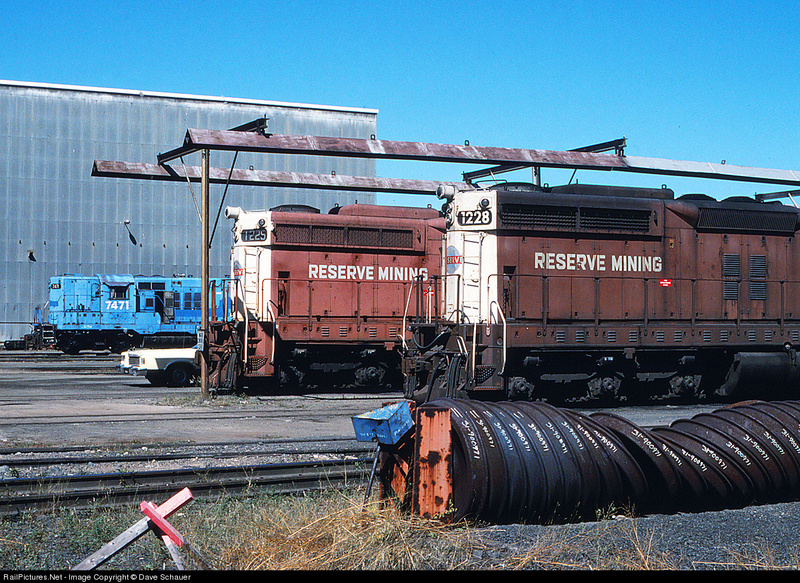 It was assumed by all that it would be coming to the museum in Duluth when the tie plant closed which, even then, was known to be fairly imminent – to this day out in the weeds behind the museum you can see a pair of wooden side frame 6-wheel trucks that were gotten from the DMIR in anticipation of being put under the Brainerd car. Something happened after I left in mid-1978 because shortly (maybe as much as a year) after leaving the plant closed and the car was, if I recall correctly, burned, the BN (and for some reason I recall that it was the Law Department) having decided that they had “already given the Museum enough”. This makes no sense, of course, as there was zero salvage value of the car so I can only assume that either  somehow someone at the museum had p***ed off the BN, or else (and I think more likely) someone at BN had a grudge against Tom Lamphier who was president of BN at the time and a very strong supporter of the museum. It’s a shame as it was really (or could have again been) a stunning car. I’m sure that at this point we will never know the whole story. Burlington Northern - and later BNSF - always seemed to like their fleet of SD9s, which is probably one reason they stayed on the roster as long as they did. In a somewhat odd move, in 1989 BN bought eight second hand SD9s and rebuilt them for regional freight and transfer service. 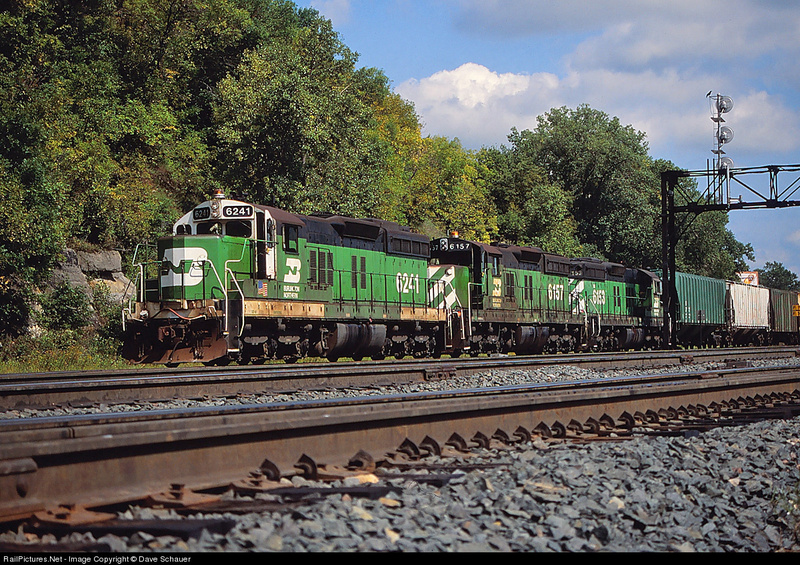 Two of those were former DM&IR units acquired through ILS, ex-132 and 145 (the other six were ex-B&O). I always kept an eye out for these two and on a nice summer day in 1994 I came across the 145 (BN 6241) leading a transfer out of Dayton’s Bluff for Northtown. 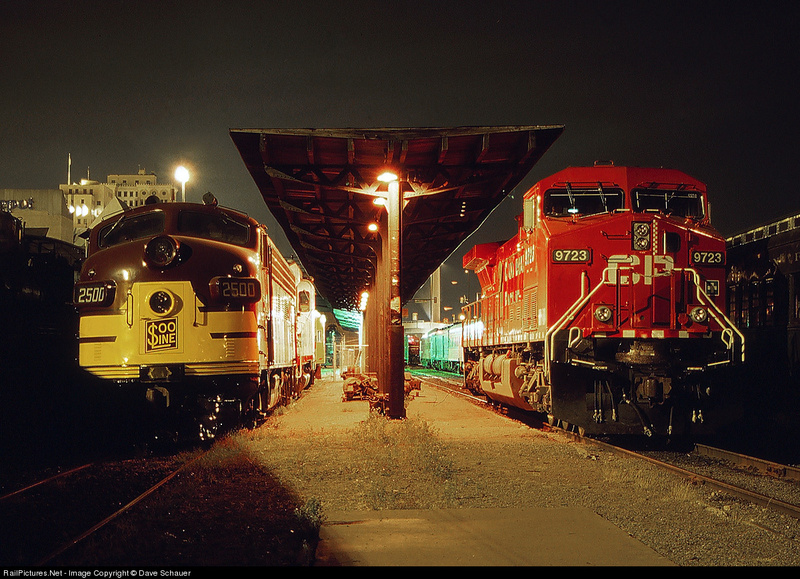 A trio of SD9s was fairly common power on these moves for a number of years well into the BNSF era. Last night after delivering a Pokegama transfer into Proctor Yard, we parked our power over at the diesel shop which was full of power, more that I have seen in recent time. So here is a snapshot of what I saw. DM&IR 403 IC62xx B&LE 909 heading down Proctor Hill with a dock train. 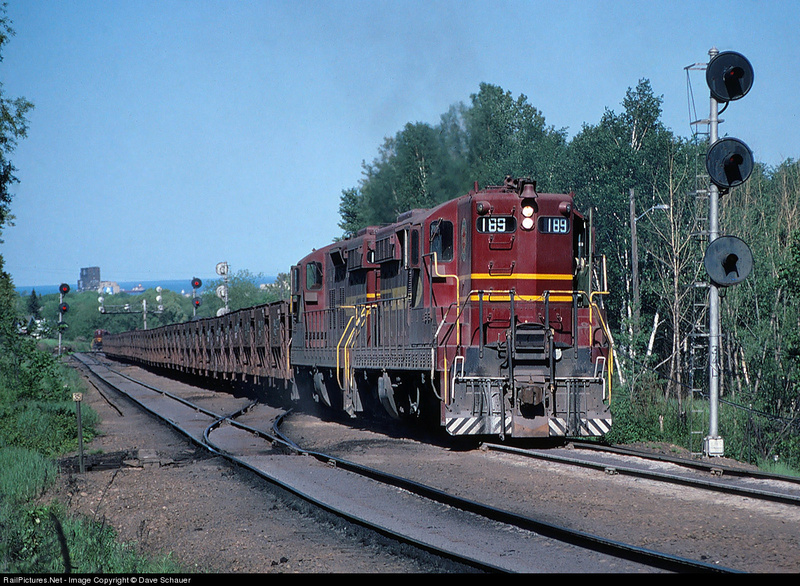 DM&IR 215 and CN 5318 on the E-Lead Switch. DM&IR 211 still parked in the former Mallet Stall location. Behind the shop, GTW 54xx still in grey KCS paint. On the ready tracks in no particular order. No idea what was inside the shop but I am guessing the DM&IR 212 was inside finally getting some attention to address the oil leaking issue it has. I think the city was in negotiation with CN to keep the base as a fishing pier but not sure where that ended up. That was such a dominate structure along the waterfront it is sad to see it go. This shot shows a portion of the dock taken in 1997 during the WC era. Nine years ago today the papers were officially signed and Great Lakes Transportation became part of CN. For today’s flashback I dug this slide out from my early years of shooting as I feel it reminds me of the classic DM&IR I grew up with – ore trains on Proctor Hill. I vividly recall hearing them pull empties when I lived in east Duluth – the sound would carry along the hillside when the wind was out of the southwest, which was common in the summer. The Missabe would lug 140 cars up the grade with two, three or sometimes four SDs in notch eight and usually at a fast walking pace but not much more. Today CN still moves trains up and down the Hill and with much more horsepower they breeze up grade relative to the Missabe in the 1980s. The 2004 purchase impacted not just ore trains but how general freight moves around the Twin Ports as well. With warmer weather NSM has been running DP trains on days other than just Thursday. Last week a 208-car train was operated. They typically leave a little later in the morning than 5:30~ thus making for some nice available shooting near Toimi. The down side is the larger trains mean fewer trains. This flashback installment takes us back a little over 10 years to a patented SRG Railfan Weekend at the LSRM. CP loaned a then-new GE to use in static photos and it was positioned next to Soo 2500A. Night shots with slides was a lot harder than digital but if you had good handlers they always seemed to turn out. Thanks Steve and Jeff.